A rare oak framed Arts & Crafts period chromolithographic print after George Maunoir Heywood Sumner (1853-1940); WAS Benson’s cousin. 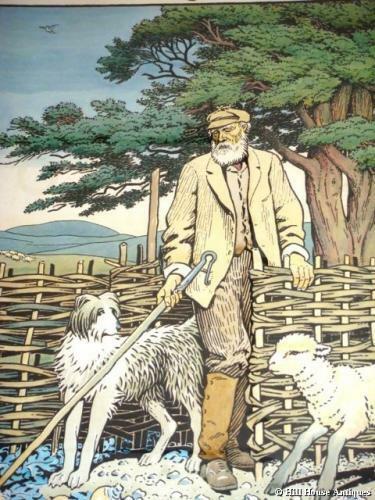 Entitled “The Shepherd” and with further verse to base; “Oh I be shepherd i’ the farm wi’ tinklen bells an’ sheep dogs’ bark. And wi’ my crook athirt my arm, Here I do rove below the lark” taken from Poems of Rural Life, by the English poet, writer, minister & philoligist, William Barnes (1801-1886), who, amongst other credits, was famous for his local Dorset dialect poems. Originally published by George Bell & Sons of York St, Covent Garden, London c.1901/2 for the The Fitzroy Picture Society; and printed by James Ackerman of London. The Fitzroy Picture Society was founded in 1891 by AH Mackmurdo, Heywood Sumner and five other artists, with the aim of producing printed pictures & posters for “Schools, Mission-Rooms and Hospitals”; they were sold in London, Paris & Boston. The Victoria & Albert Museum in London bought nineteen of them back in 1895, of which fourteen were by Heywood Sumner. Ref: Heywood Sumner; Artist & Archaeologist 1853-1940 by Margot Coatts & Elizabeth Lewis; Winchester City Museum.